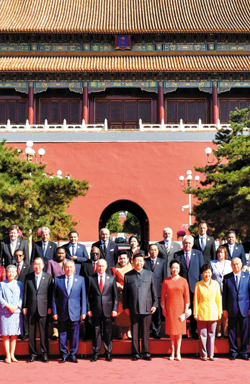 President Park Geun-hye joined Chinese President Xi Jinping in Beijing on Thursday for a massive military parade commemorating the end of World War II. She stood alongside Russian President Vladimir Putin and other dignitaries in Tiananmen Square as thousands of troops and millions of dollars worth of equipment passed by in the carefully choreographed event. Notably absent were Western leaders like U.S. President Barack Obama, who believe the event is yet another sign of China's growing aggressiveness in the region. In a speech on Thursday, Xi announced plans to cut troop levels by 300,000, a move aimed at allaying such concerns, but there was no lack of military might at the parade as 12,000 troops, 200 aircraft and around 500 weapons systems, including mid-range ballistic missiles, were displayed before the world. Park decided to attend despite the West's anxiety as she walks a fine line between her government's close political ties with the United States and a booming economic relationship with China. China now accounts for a full quarter of Korea's overseas trade and has become the nation's top trading partner. The South Korean government also often looks to the Chinese for their influence over the increasingly unpredictable North Korea. "The main reason for the decision to attend the military parade was the belief that China's cooperation is essential, not only for peace and prosperity on the Korean Peninsula, but reunification as well," a government official said. It was impossible not to notice historical irony at the event. The Gate of Heavenly Peace, where Park stood on Thursday, was the same location where the late North Korean founder Kim Il-sung stood alongside Mao Zedong to observe the Red Army in 1954 and 1959. The parade comes at a crucial time for diplomacy in Northeast Asia, and observers hope that Park will be able to maintain close relationships with both Beijing and Washington. "Korea and China agreed to work to resume the trilateral summit that involves Japan as well, and the Seoul-Washington and Beijing-Washington summits are set to take place soon," said Park Byung-kwang, a research fellow at the Institute for National Security Strategy. 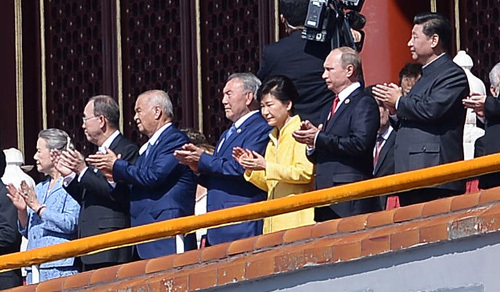 "It's important that Park's attendance at the Chinese celebration leads to some beneficial results for the political situation in Northeast Asia." attesting to China's increasingly rocky relationship with the North.